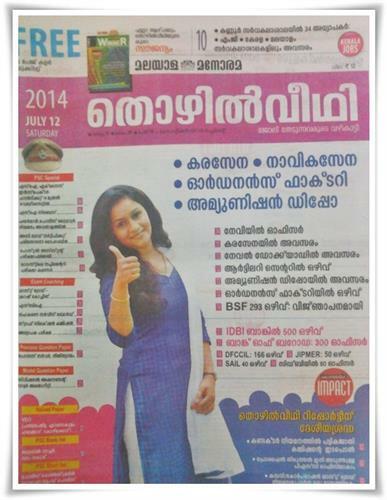 Manorama Thozhilveedhi, the leader among employment newspapers in Kerala has published its 12th July 2014 issue. As usual, the current issue of 'Thozhilveedhi' is packed with a bunch of opportunities for the job seekers. The major highlight of this issue is the arising vacancies in Indian Army, Indian Airforce, Ordinance Factory, Ammunition Depot and Naval Dock along with prospects in various Universities, Colleges and Schools are also reported. While going through the pages, 293 vacancies in BSF, 500 jobs in IDBI bank, 300 officers in Bank of Baroda, 166 opening in DFCCIL, 50 in JIPMER, 40 posts in SAIL and 80 officers in CIDB would facilitate people with desired qualification to apply for the posts. Other rising vacancies are in Indian Defense Ministry, 47 principals in Navodaya, 60 opening in Ambedkar University and 40 in Steel authority. Solved papers of Kerala PSC Village Extension Officer (Pathanathitta, Ernakulam, Palakkad and Kozhikode), PSC rank list of Tribal watcher and PSC short list of Police Constable Driver are published in this issue for reference. Special crash coaching for Cooperative Service Board, Staff Selection Commission and HAS/KTET are also included. As PSC special, exam and hall ticket details of SI, Excise inspector exam, SI Syllabus and exam schedule of August 2014 have also found space in the current issue of Thozhilveedhi. As usual the exam coaching for SBI exam by Time Institute is continued in the 12h July 2014 issue too. Job seekers can best use this issue of 'Thozhilveedhi' to apply for suitable employment vacancies depending upon their qualification. This employment news weekly has already become the part of a large reading community in Kerala. 'Thozhilveedhi' is considered to be an effective platform for job vacancies and career training. With a circulation of more than 1 lakh prints, this news weekly has changed the life of many young people. So if you are a youngster having high dreams to get a reputed job, do make sure to go through the current issue of Thozhilveedhi to apply for a preferred post. Vanitha malayalam magazine 1- 15 July 2014 issue featuring Kavya Madhavan and Ann Augustine is now available. Even though Vanitha magazine 1- 15 July 2014 issue free online reading is not practical, you can read the digital version by paying money. The highlight of July 2014 issue of Vanitha will be the interview of actress Kavya Madhavan. Kavya speaks about her filmy career and marriage dreams in this issue.